The meeting began at 20.10 and closed at 21.30. Congratulations to Kay Coleman, Volunteer of the Year 2015! The annual Jim Quigley Award for Volunteer of the Year allows the Skerries Community Association (SCA) to acknowledge a local volunteer (or group of volunteers) and give them well-deserved recognition for their work. 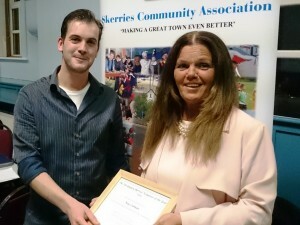 This year, the award went to Kay Coleman of Skerries Chamber of Commerce. Kay was presented with it at the SCA Annual General Meeting in Skerries Community Centre (Little Theatre) last Friday night (11 September 2015). In his introduction to Kay’s work, Geoff McEvoy, chair of the SCA, stressed her long involvement with Skerries Chamber of Commerce and mentioned how Kay is instrumental every year in arranging the Christmas Lights and the St Patrick’s Day Parade. He said: “This award is a long overdue acknowledgement from her friends, colleagues and community,” and read out excerpts from the many emails the SCA had received on behalf of Kay in the process of finding the right person for the 2015 Award. In her heart-felt acceptance speech, Kay stressed her love for Skerries and her joy in seeing so many improvements in our town over the years, through the efforts of local people. Kay joins a long list of previous winners of this prestigious award, which is given in honour of Jim Quigley, a long-time champion of community development. Jim was involved with Skerries Development and Community Association (as it was known then) over 22 years; he was Chairperson of the SDCA for ten of those years and worked on many, many projects, including securing a Community Centre for our town. The annual award is a very fitting way to honour Jim.